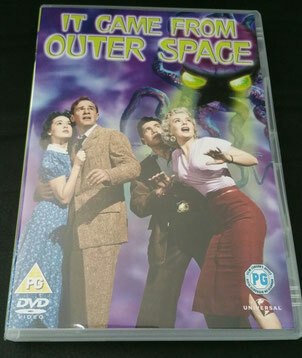 It Came From Outer Space is a science fiction movie from 1953 by Universal. Since I’m a big fan of the Universal monster movies and 1950’s sci-fi movies I really wanted to have this DVD. So Carola was kind enough to get it for me for Christmas. Last week I finally got around watching it and I sure wasn’t disappointed. The film takes place in a small town. A meteor crashes in the desert near the town. John Putnam (played by Richard Carlson) and his fiancée Ellen Fields (played by Barbara Rush) see the meteor fall from the sky and crash in the desert. The day after they immediately go out to the crash site to see what’s going on. John finds out it’s actually not a meteor that’s crashed here but it's actually a space ship. Shortly after that a landslide cases the ship to be covered in rock. Since John is the only one who saw the ship, nobody believes him. John is an amateur astronomer and people think he’s just making this up to get attention so he can write a book about it. But soon strange thinks start to happen around the town. John and Ellen have an encounter with the strange visitor from outer space together. So now together they try to figure out what’s going on. They discover that people start to disappear and that the aliens can actually take the form of a human. The thing that really sets this film apart from many other sci-fi films of this era, is that the aliens aren’t hostile. They just crashed on earth by accident and want to repair their ship to continue their journey. The people in the town on the other hand are afraid and want the aliens to be gone. I think this movie has a great plot. The fact that the aliens can change into a human form was clearly an inspiration for “Invasion of the Body Snatchers”. It’s also nice to see Richard Carlson in this film, he would later become known for his role as Dr. David Reed in “Creature From The Black Lagoon”. This was actually the first sci-fi movie done by Universal and there would soon be more to follow. Of course the 50’s are famous for their crazy sci-fi movies and for me only a few really stand out. But I think this one of those, just because of the plot that is so different from many others. Most of the time they use a first person perspective from the aliens which is done with a great effect, I think this gives a great touch to the movie as well. The film was shot in 3D, I'd realy like to so see this film in a cinema with 3D effects just like it was when it was released in 1953. I’d recommend buying this DVD release. It has great picture and sound quality. 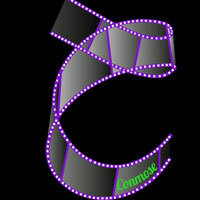 And it also has a 30 minute bonus documentary on the film. Which I thought was a real cool extra. The documentary is about the start of 1950’s sci-fi movies but also talks about this film itself. It also gives some interesting facts about this movie. The DVD also has a feature to watch the entire film with commentary by film historian Tom Weaver. And it also has the original theatrical trailer and a photograph and poster gallery. I’m glad I watched It Came From Outer Space. I have to say I didn’t like it as much as Invasion of the Body Snatchers or The Thing From Another World. But if you haven’t seen It Came From Outer Space and you like 1950’s science fiction movies, or are a fan of the Universal monster movies, I suggest you’d give this one a try.